Between fits of laughter during lunch on Thursday, my friend tried to explain the new ad that VW plans to air during Sunday’s Superbowl Halftime show. From his description, I wasn’t sure how the ad, of a white man who returns from his vacation with a Jamaican accent and a laid-back-turn-your-frown-upside-down kind of attitude, was supposed to sell Volkswagen cars – but I was curious to see it for myself. I had been on the road for three days without television, radio or Internet and as soon as I returned home, I went online. Before I could even search for the ad, I noticed that I’d received five emails with VW in the subject line. One was a forwarded message of a press release that was put out by a Jamaican organization in support of the ad. I read it quickly but since I hadn’t yet seen the ad, I couldn’t understand why it was even necessary. Now I was really curious. I did a Google search and was surprised to see that the entire page had article after article about the ad. Scanning a few, I noted that several people thought it was racist, others weren’t sure. I was mystified. I hadn’t gotten a sense from my friend’s description that he was offended. Why was everyone making such a brouhaha? What were we missing? Have we become so sensitive that we can’t laugh at ourselves? I was prepared to hate the ad but when I watched it, I couldn’t stop laughing. Maybe I should watch it again to get what all the fuss was about, I thought. I did but I still didn’t get it. Although it was at times uncomfortable, my friends and I laughed at the portrayal of the Hedleys, a Jamaican family, in the always irreverent, always politically incorrect 1990s hit television show, In Living Color. I don’t remember anyone questioning then whether the popular show was racist or asking for it to be canceled even while it referred to us “coconuts” and played on and perhaps help perpetuate certain stereotypes. Though we’re certainly not naive or unsophisticated about stereotyping or racism, every Jamaican I’ve spoken with or emailed about the VW ad thinks it’s funny. Most of us can’t understand what all “the noise,” as one friend characterizes it, is about. 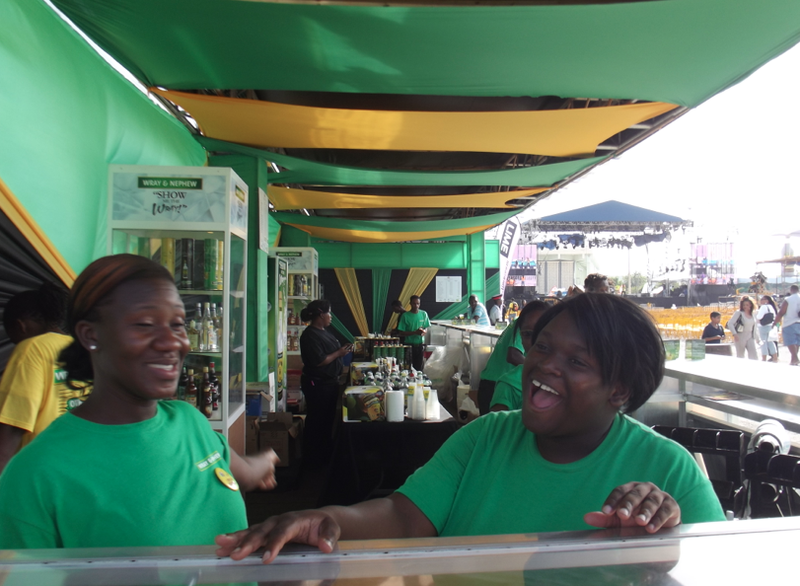 Despite high unemployment, underemployment, corruption, crime, slow economic growth and a host of other ills within the society, Jamaicans manage to maintain such a sunny disposition that last year, the UN’s World Happiness Report ranked the island the 40th happiest of 156 countries in the world. Perhaps it’s that happiness that some visitors want to take back home. They say imitation is the sincerest form of flattery. We’re flattered that VW decided to use Jamaica in their ad but maybe they should do one better: allocate a percentage of the proceeds of their sales on this campaign to fund automotive education here. In the meantime, we have our own unique way of responding to the ad. See for yourself. If it doesn’t make you smile, nothing else will. I liked the ad – and I like the theme of happiness. You’re right – we shouldn’t always take ourselves so seriously. And if you got a good belly chuckle that’s saying a lot. So glad to get your perspective on this. I hadn’t heard all the controversy prior to seeing the ad during the game. I thought it was funny. I have to watch the response video in a little while. Game still on the TV now. 🙂 Go Niners (although it doesn’t look too good for them at this point)! I got several good belly laughs, Leigh, and sometimes that’s all we need. Frankly, I think we don’t laugh enough. I also like the theme – very appropriate. Thanks, Jackie! I have it in my head too. It’s such a catchy jingle, it’s hard to be sad when you listen to it. There has to be a balance, Arti. We need to be able to laugh at ourselves and be serious when necessary. Thanks, Arti. Wish you the same. I’d love to hear what you think of the response video, Cathy. Someone has a really good sense of humor, just what we need. I’ve been watching on and off – that 109 yard touchdown was impressive! I heard a lot about it too but just got to watch it through your site. It was funny and left me smiling… But I can understand the brouhaha. Like you, I think VW should give a portion of their earnings to a Jamaican org for children. Sadly, I couldn’t see the other video as it is marked private. I hadn’t heard of the controversial ad but glad you brought it to my attention. It made me smile and the response ad made me laugh. Like Jackie, the “Get happy” jingle is now dancing around in my head. We all need a good laugh every so often. I hope they do give Jamaica some proceeds from those ad sales. It’s a funny ad that has us laughing here. It made me remember that no matter how perfect I think my accent sounds when I speaking another language, I still sound like a non-native. I’ve seen it now a few times since the Superbowl. I still crack up and hum along with the song, it’s definitely catchy! Sorry you couldn’t see the other one, Elizabeth. I’ve sent you a new link via email. I couldn’t watch it on your link, sometimes we can’t get video here because of international copyright. If you and your fellow Jamaicans aren’t offended then why are the whitefellas? I saw a comment saying that the protestors are confusing race with culture, and thought that was a fair comment. I’ve heard that from a few people who’ve tried to watch videos in different countries. We think it’s hilarious. We have to be able to laugh at ourselves, life can’t be all serious.